İstanbul Dış Hatlar Terminaline Astırttığımız, Yasa Dışı Hayvan Girişinin Önlenmesine Dair Panolar..
Bunların ayrıca diğer dış hat terminallerinde ve gümrüklerde de olması gerekiyor. Karaköy ’de özellikle Ukrayna ve Rus Gemilerinin yanaştığı yere de astırmıştık.. The board we put up in the International Terminal of the Istanbul Airport on how to prevent the illegal import of animals. These information boards also need to be at other international terminals and customs offices. We had them put up in Karakoy, where many ships from Ukraine and Russia dock, but somehow we were not able to take a photo of those boards. We would be grateful if you check whether these boards are still in place and are at a spot where people coming from abroad can see and let HAYTAP know of your findings. We need to remind all that this is only one of the precautions we can take to prevent the illegal pet trade that pet shops are directly responsible for. It is one of the ways to draw the attention of the many related offices of the government to the subject of illegal animal trade. One of the ways to control animal population and their welfare is to turn off the faucet at its main valve. You can have a look at our website’s section on the reality behind pet shops and read the many articles written on the topic. We would also like to draw your attention to the article “Turning Off The Tap by Closing The Valve” (available in English) Please click here. 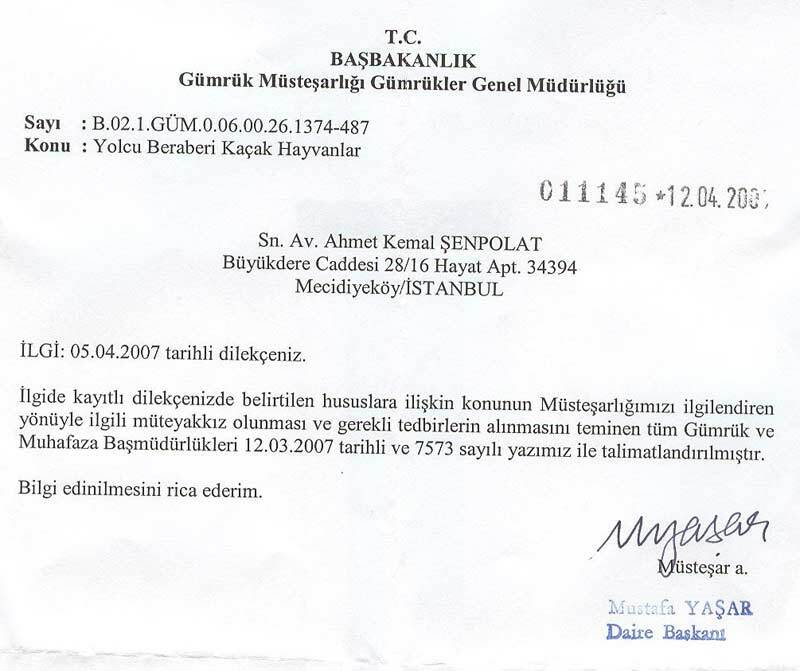 Official letter from the Undersecretary of Customs, Customs General Directorate addressed to HAYTAP Chairman Ahmet Kemal Senpolat, approving the use of these boards in all customs offices. Official letter from the Undersecretary of Customs, Customs General Directorate addressed to HAYTAP informing that these signs will be hung up in the arrivals hall at the Istanbul Ataturk Airport and Kapikule (Edirne) Customs Directorate. GEÇİCİ MADDE 3. - Bu Kanunun yürürlüğe girmesi ile her türlü ev ve süs hayvanının ithal ve ihracı, insan sağlığının korunması ve hayvan popülasyonunun kontrol altına alınabilmesi için 10 yıl müddetle yasaklanmıştır. Buna aykırı hareket edenlere ve şeriklerine, hayvan başına, üç bin Yeni Türk Lirası idari para cezası verilir. Tekerrüründe ise ceza üç kat arttırılır. Bu suçu işleyenler, kamu görevlisi ise ceza bir kat arttırılır. Kaçakçılık mevzuatı kapsamında yargılama hükümleri ayrıktır. Özellikle yurda giren kaçak hayvan ithalatının önü kesilmediği sürece ve bunlara talebi körükleyen pet-shop’lar denetlenmediği sürece (hatta bunlara gelişi güzel ruhsat verildiği sürece) yapılan çalışmalar aslında küçük iyiniyetli hareketler ve akıntıya karşı kürek çekmek olarak kalacaktır. Çünkü hayvan popülasyonu, bir şekilde kontrol altına alınmaz ise tüm yapılan çalışmalar boşa gidecek, Hakları korumak da savunmak da zorlaşacaktır. Gelişmiş ülkelerin kendi memleketlerine insan bile sokmadan önce ne kadar tedbirli davrandıkları, insanlara vize, hayvanlara karantina ve aşı karnesi uygulamaları, hatta her türlü bitki tohumu girişinin bile sıkı denetime tabi tutulduğu, malumunuzdur. Halbuki bizde, bunu bir türlü uygulayamadığımız için, ev ve süs hayvanı ticareti yapanların, sırf ekmek parası kazanması için bu ticareti yapmalarına göz yumduğumuz için ve kontrol ile denetim mekanizmalarımızın gereği gibi çalışmayıp sırf kanunlarda kelime babında kaldıkları için hayvanlarla ilgili ortaya çıkacak hiçbir problemin önüne geçilememekte, üstelik hayvan barınaklarındaki çok kötü görüntülerin ortaya çıkması da engellenememektedir. Özellikle, eski doğu bloku ülkelerinden ülkemize bu süs ve ev hayvanları yoğun bir şekilde girmekte, hatta bizim ülkemiz için özel üretim yapılmaktadır. Bunları çok ucuz fiyata mal eden bu kişiler, ülkemizin hem sağlık, hem de hayvan populasyon kontrolünü bozmaktadır. Yurt içinde satış yapanlar ise faturasız satış yaparak hem vergi ödememekte, hem de bu hayvanları uygun fiyatlara satmaktadır. Satılan bu hayvanlar ise geçici bir heves olarak alındığından bir kaç yıl içinde ya barınaklardaki olumsuz koşullara terk edilmekte ya da belediyeler tarafından itlaf veya zehirleme gibi korkunç sonlara mahkum olmaktadırlar. Öte yandan, aynı şekilde yurtdışına tırlarla ve gemilerle kaçak olarak kürk üretimi nedeniyle kedi ve köpekler kaçırılmakta, çok kötü ortamlarda istiflenmekte, yurtdışında da büyük olasılıkla bu hayvanların kürkünden faydalanılmakta, hatta hayvanların üzerinden uyuşturucu kaçakçılığı bile yapılmaktadır. O nedenle, her koşulda hem giriş hem çıkış sıkı şekilde kontrol altına alınmalı, kanunun yürürlüğe girdiği andan itibaren sınırlama getirilmelidir. Aşılama, kısırlaştırma, micro chip – kayıt altına alma gibi yöntemlerle, uzun vadede, belki sokak hayvanı ve barınakların da ortadan kaldırılacağı öngörülmektedir. Yurda giren her 6 çift kedi ve köpekten, üreme sonucu, 6 yılda, 60 bin kedi köpek oluşmaktadır. Bu ticarete göz yuman görevliler hakkında da bu nedenle cezalar bir misli arttırılmıştır. TEMPORARY ARTICLE 3. - With the implementation of this Law, the import and export of all pets will be banned for the next 10 years with the aim to protect public health and control animal population. Those who act against this law and their partners will be fined 3000 Turkish Lira per animal. With repeat offences this fine will be tripled. If this crime is committed by public officials, the fine will be doubled. Sentencing based on regulations on illegal trafficking will be done separately. So long the illegal import of animals into this country is not stopped and the pet shops that fuel this trade are not inspected (and there comes no end to the tossing of permits for these shops) all activities will stay as small well intentioned gestures and actions against a fast flowing current. If the animal population is not somehow kept restricted, all efforts will be in vain and it would become even more difficult to defend their rights. As we all know, developing countries act cautiously before even letting humans into their countries and have visa obligations for people, quarantine and vaccination card requirements for animals, as well as adhere to strict rules when it comes to the import of any kind of plant seeds. Whereas in our country, since these restrictions are not being implemented because the pet trade is making a living out of this illegal trade, the current situation is being overlooked. Control and inspection mechanisms are also not being used and regulations are only seen as words and not abiding lawful rules as they actually are, there will come no end to the many problems involving animals, including the horrific scenes in animal shelters. Many pet animals are coming into our country especially from the old Eastern Block countries, so much so that they even produce specifically for our country. The people who allow this to happen with as low as possible costs, form a threat to our health and our current animal population control. Those who sell these animals without an invoice are further guilty of evading taxes while they are able to sell these animals for relatively cheap prices. Since many of these animals are bought in the spur of the moment, they are often left behind in the horrific conditions of our animal shelters within a few years or these animals face a horrible end in which municipalities are responsible for killing and poisoning them. On the other hand, many cats and dogs are being illegally transported in trucks and ships for the fur trade and they are forced to live under horrible conditions. This fur trade is even being used in the illegal trade of drugs. This is the reason why restrictions should be brought for the export and import of all animals once this law comes into effect. The most important article of this law is probably the temporary article number 3. Animal trade should definitely be banned in the next 10 years or until the current animal population is under control through other precautions and through vaccination, sterilisation and keeping records by using micro-chipping. It is predicted that in the long run stray animals and animal shelters will disappear. From every 6 pair of cat or dog that enters our country, the number of cats and dogs reaches 60 thousand through reproduction. The punishments for those officers who overlook this trade has therefore been increased in this proposal.